Below is a list and explanation of each of the services I offer. If you have any questions please feel free to a contact me. I treat all my students and clients as Vocal Athletes. I coach them to be their Vocal Best. 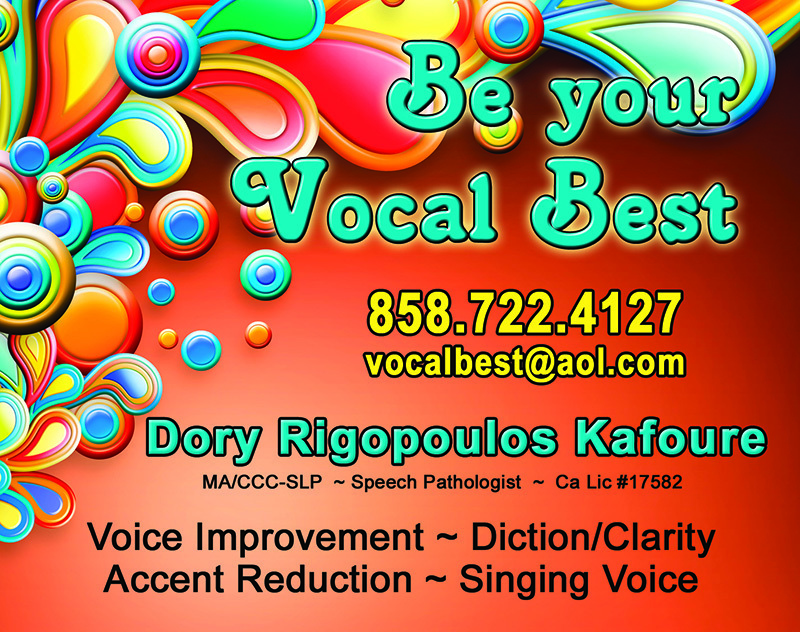 Voice Coaching can include voice improvement, diction, singing or accent reduction. VOCAL TIP: Check out these two videos regarding vocal health. They will show you the use of straws to help with breath flow, resonant voice, and vocal health. 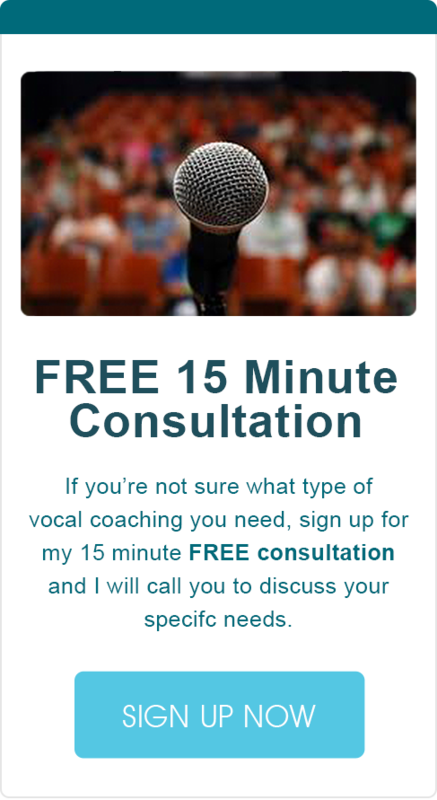 Do you have issues with vocal fatigue and strain? Then learning to speak with a resonant voice is the answer. Resonant voice facilitates the best vocal output with the least effort. It reduces stress to the vocal folds and improves voice efficiency by directing vibration to the front of the face. In addition, we’ll look at all the other parameters that may influence your voice such as: amount of voice use, voice volume and pitch, breath management, your style of talking, members in the family, stresses, daily activities, work environment, vocal health, general health and outside activities, etc. VOCAL TIP: Try humming with your lips closed and a slight space between your back teeth. Press your lips together just slightly and feel the buzz at your lips and the front of your face. Hum a little higher in pitch and a little lower. Be sensitive to where you feel the most buzz. This is the beginning of resonant voice. Vocal nodules can occur from overuse or incorrect use of the voice. 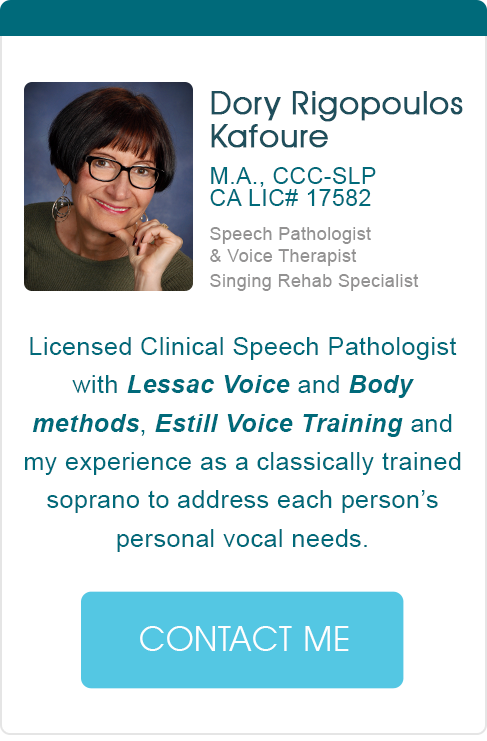 I’ve helped three performers resolve their vocal nodules without surgery. Vocal nodules may resolve when the issues that caused the nodules are identified, modified or replaced with healthy technique. Symptoms can include a breathy or hoarse voice resulting in vocal fatigue and increased vocal effort. Vocal folds can also become swollen and irritated with notable changes in the voice. That’s why it’s beneficial to catch things early. VOCAL TIP: Say, “My mom makes marmalade” while lingering on each ‘M”. You’ll feel a vibration at your lips and front of your face. This is where your voice sounds best and easiest to produce. I will evaluate your singing and speaking voice because sometimes your speaking voice can affect your singing voice. I’ll ask you to bring a song to sing. We’ll chart your vocal range, volume levels, ease of glides and breath management. We’ll review vocal health, your singing style, practice time, rehearsals, and performance activities. If you notice persistent changes in your vocal range, voice breaks and increased effort consult an ENT or Laryngologist. VOCAL TIP: Welcome to the Twang Farm: an easy way to change your vocal style. Here’s one example: sing ‘BAE’ like a sheep. This is most useful for lower notes in your range. It will put your tongue in the position to sound somewhat brassy for that Broadway sound. If you want a higher sweeter sound sing on the owl sound of ‘HOO’. Sing your whole song using one animal. Then, mix up the ‘bae’ for low notes and ‘hoo’ for higher notes. Now go back and match the real words with what you just sang. There are other animals in the Twang Farm which also help with singing different styles. I’m very experienced with speech sounds and diction. If speech sounds are mispronounced they can affect clarity and make what you say or sing difficult to understand. When singing, there are a set of diction rules that can help you ‘explode’ specific words and also help you conserve air. Learning how to link words can help breath management and speech flow. VOCAL TIP: For speaking: go thru your script and underline all N’s, M’s and NG’s. Now say the text lingering on those sounds. You will improve the flow of your material and will heighten interest. As we age so does our voice. This is due to changes in lung elasticity and vocal fold changes. Women’s voices usually decrease in pitch and men’s pitch increases. Older people often live alone and the amount of talking throughout the day is minimal. The goal is aimed at improving vocal efficiency which in turn will improve voice quality and volume level. The GOOD NEWS is that it is possible to improve the aging voice: speaking and singing! VOCAL TIP: Read out loud for 10 minutes every day. Loudness level should be as if you are talking to someone in a chair across from you. It should not hurt. After a week, increase the time to 15 minutes. You should notice your voice getting stronger after 2 weeks. Don’t forget to drink more water to keep your vocal folds hydrated as you use your voice more and more. This is for English speakers who wish to speak with Standard American English pronunciation. We identify the target sounds you want to change and work through words, sentences, conversational speech and relevant use in your individual environment or job setting.